3 Bedroom Semi Detached House For Sale in Nottingham for Asking Price £145,000. 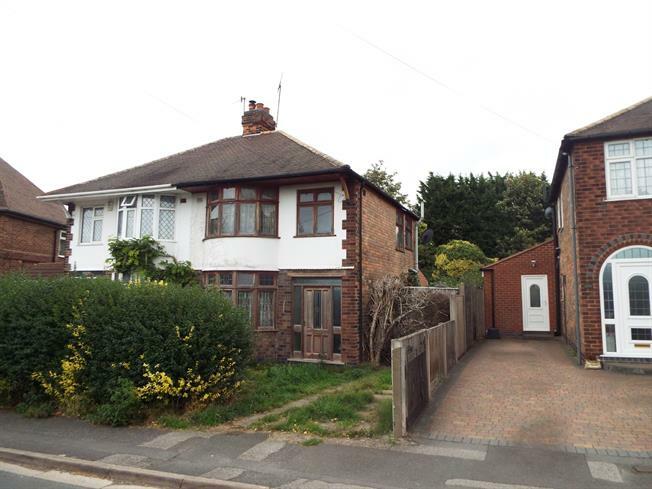 This 3 bedroom semi-detached property is a fantastic opportunity for investors! The accommodation comprises of an entrance hall, living room, dining room and has been extended to the rear to create a large kitchen space. Upstairs there are three bedrooms and a family bathroom. Outside, the property offers parking for two cars to the front of the property with a large rear garden. The property is in need of a full renovation. Single glazed bay window to the front of the property, access from the hallway. French doors to the rear with access to the garden, access to the kitchen to the rear. Gain access from the hallway. Access from the Dining room, single glazed windows over looking garden. Master bedroom. To the rear of the property, single glazed window overlooking the rear, access from the landing. Double bedroom, single glazed bay window over looking the front of the property, access from the Landing. Single bedroom, single glazed window over looking the front, access from the landing. Standard WC, panelled bath, electric shower, pedestal sink.